"This is the second special model in our 25 year anniversary trilogy and like the GSX-R750 echos the timeline of range development. 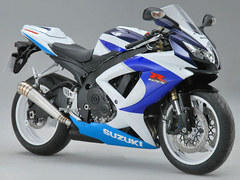 In 1985 the GSX-R750 first appeared, rewriting the rules in the sportsbike category, before Suzuki moved the game on again in 1997 with the introduction of the very first GSX-R600. We pay tribute to the GSX-R600 with this special model, while we look to complete this special trio of models later in the year."